The 2018 Subaru Forester is a dynamic, ready-for-action vehicle that will take you on your greatest adventure while keeping you safe and comfortable. The 250-hp Subaru Boxer Engine with Lineartronic CVT with Manual Mode will take you from your everyday commute to a daring road trip without missing beat. Even when going off road, with amenities like leather-trimmed upholstery, you'll be as comfortable as if you'd never left home. 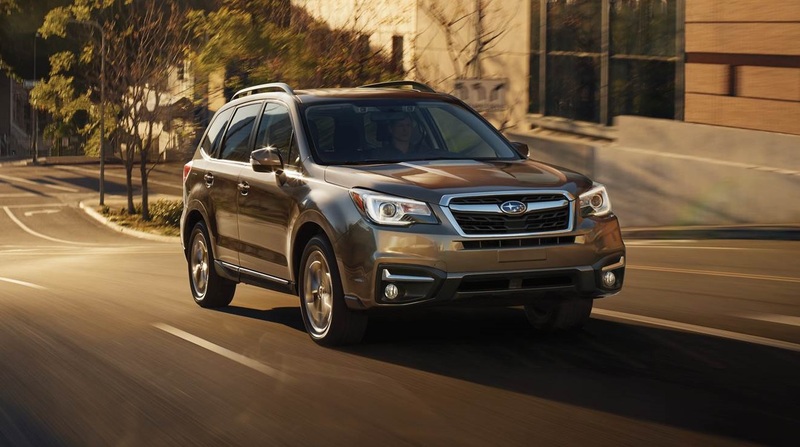 If you're in search of a 2018 Subaru Forester in Boulder Colorado, you can find the perfect vehicle to suit your needs at Flatirons Subaru, serving Denver Broomfield Boulder. While high demand for Subaru has made it harder to find than other models, you can be sure they'll do everything possible to get you into the car of your dreams. With these performance-inspired features for a such reasonable price, this is one deal that's too good to pass up! Offering, safety, function, and power, you'll have it all at a price that can't be beat. Whether you're someone who likes to go on adventures or are looking for a safe, dependable car to get you to and from work, this is the trim to go with. With the panoramic power moonroof and leather-wrapped steering wheel, you can catch a breeze on a warm sunny day while riding in style. Ready for any adventure off the beaten path, the 2.5i Limited trim has you all set with voice-activated GPS navigation system, auto-on/off headlights, a removable cargo area tray and cover, Harman Kardon premium audio system, and Reverse Automatic Braking (RAB). These upgrades will have you blazing new trails while you the comfort and sophistication of gorgeous leather-trimmed upholstery. Every last detail is designed to make your ride memorable. With the heart of a champion and a body built for safety, security, and durability, the 2.5i Touring is all you'll ever need for your commute or off-road adventures. If you want to learn more, contact Flatirons Subaru for all trim levels and vehicle information. When you're shopping for your next Subaru, there are a lot of decisions you'll have to make, but one choice you'll be glad you made is to go to Flatirons Subaru for all of your automobile shopping needs. Serving Denver Broomfield Boulder in Boulder Colorado area, the focus of the dealers is on your satisfaction. With a well-trained knowledgeable team, huge selection of vehicles, and outstanding pricing, you'll know you came to the right place from the moment you set foot in the lot to the moment you leave in your new automobile. Their goal is to exceed your expectations, and with their high standards for customer service and their exceptional selection, this is a dealership you'll be returning to again and again. Flatirons Subaru, serving Denver Broomfield Boulder. Call us today at (877) 464-2714. *Article for general informational purposes, for complete trim level details, please contact the dealership.